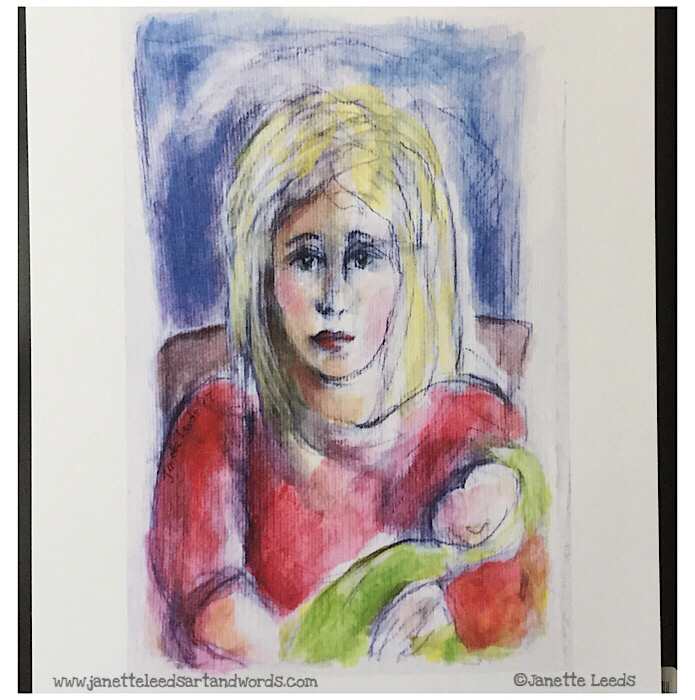 I often draw and paint images of a mother and baby; as a mum of four boys (young men now) it’s probably not surprising. I do so many of them I’ve decided to begin giving each a number and letter as a title; which I also do now with my flower artworks. A bit of a melancholy look on her face; think it could well be tiredness! I painted this with gouache, on acrylic painting paper. After I scanned it in with the Scanner Pro app, I softened some of the outer edges with the artist crayon in Procreate (hmm, a suitable name in this instance); and added a touch more media in places. You can see this in the video below. It printed up well on the Epson Archival Matte paper. I love how it shows the texture of the paper. Sort of like the edge around the pic, but may try it with out it. I’ll remove it with the eraser set on the soft airbrush in the Procreate app. Hmm, may soften the line under the right eye…difficult to know when to finish sometimes! I took a photo of the print (centred on A4 size paper) with the iPad camera, rather than with the Scanner Pro app. This gives a softer look and closer to how the print appears – though it is a tiny bit richer in colour than this. Sometimes a scan is brighter in colour than the work on paper or canvas, which often I quite like; and informs me of changes I may like to make to the original. My skills with scanning are improving. This enables me to quite easily make “reproductive” prints of some of my traditional media artworks. I also continue to experiment with beginning a work on paper/canvas, completing a large part of it in an art app; and sometimes adding more traditional art media on the print…and so on… And there’s some lovely inkjet papers that I’m trying out.